The hidden talent of a Biomedical Science student has been unearthed by UK Sport’s #DiscoverYourGold campaign. The campaign, a partnership between UK Sport, the English Institute of Sport and a range of national governing bodies, attempts to identify talented young athletes who have the potential to become future champions and provides the chance for them to be fast-tracked into high-performance sport. Student Georgia Holt was invited to a talent-identification session in June in the hope to start a journey initially in winter sliding sport Skeleton. After the first audition, which tested her on several skills such as sprinting, power and strength, she received the call that she has what it takes – to become a track cyclist. After whittling the group down through different stages, testing skills on the track as well as mental and physical ability for the role, Georgia has been selected for the final nine out of over 2,000 applicants, who will now complete the ‘confirmation’ stage of the programme in the hope to become cycling champions. Georgia said: “I’ve always been quite sporty; I’ve ridden horses since I can remember and have competed in eventing at regional level. I’ve also been part of the first team in hockey for Ratcliffe College and successfully took part in county athletics at school and I just fancied a new challenge. At first I was interested in getting into Skeleton, so applied for the talent ID programme and never thought anything of it. I couldn’t believe it when I got asked to go for testing, never mind be selected for the final nine. If you told me six months ago that I’d end up where I am today, I never would have believed you. Georgia will now embark on a six-month confirmation phase where she will train intensively. 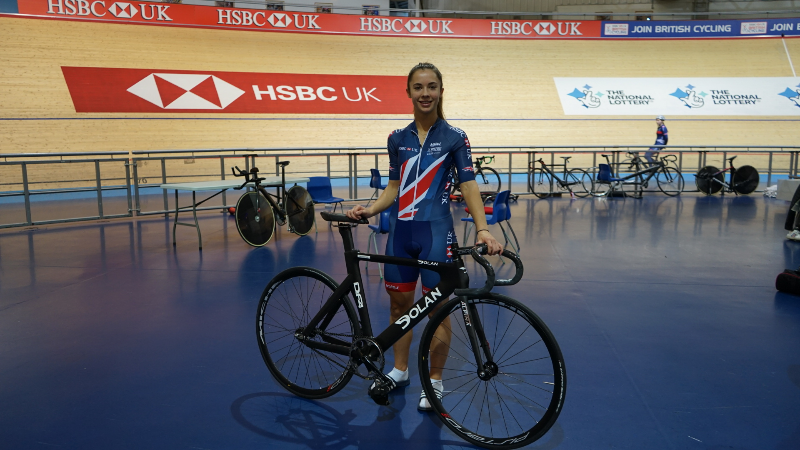 After the six months of being assessed constantly, Georgia hopes to be accepted onto the British Cycling senior academy team, with even bigger dreams of the summer Olympics in Paris 2024. Georgia will compete in her first competition at the BUCS Track Cycling Championships in December, where she will participate in the team sprint race with MMU Sport Scholar Georgia Hilleard – an established British track cycling sprinter. As part of her progression, Georgia will link with Manchester Metropolitan’s second year nutrition students. MMU Sport pair elite athletes with the students as part of the course to work together on a nutrition plan. The progression of the athlete is measured over a 10-week period in the ‘Bod Pod’ – a device used to determine body composition. Georgia said: “I’m really excited to compete for Manchester Metropolitan at BUCS. It’s not only my first cycling competition but the first time I’ve competed in front of a crowd, so it’ll be interesting to see how I handle it. Georgia will also compete in the National Track Championships in January alongside the British Cycling Senior Academy team.